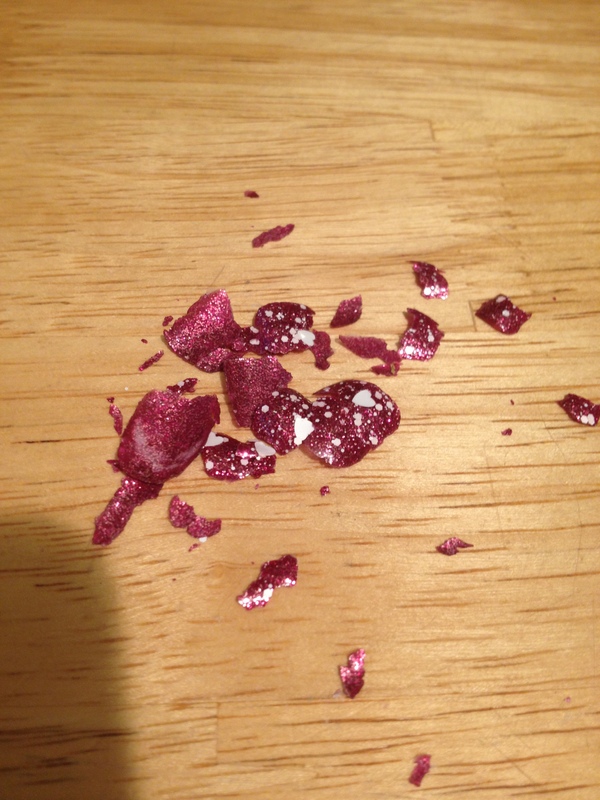 Many of us have a love/hate relationship with glitter polish. It’s so sparkly and beautiful, but removing it with nail polish remover is next to impossible. It’s even a chore with pure acetone. To remedy this, somebody somewhere came up with a peel-off base, and soon the DIY-ers were coming up with homemade solutions, most of which involved Elmer’s School Glue. I jumped on the glue wagon, and through trial and error, I think I’ve finally mastered the DIY peel-off base! After you fill the bottle half up with glue, fill it the rest of the way up with water. 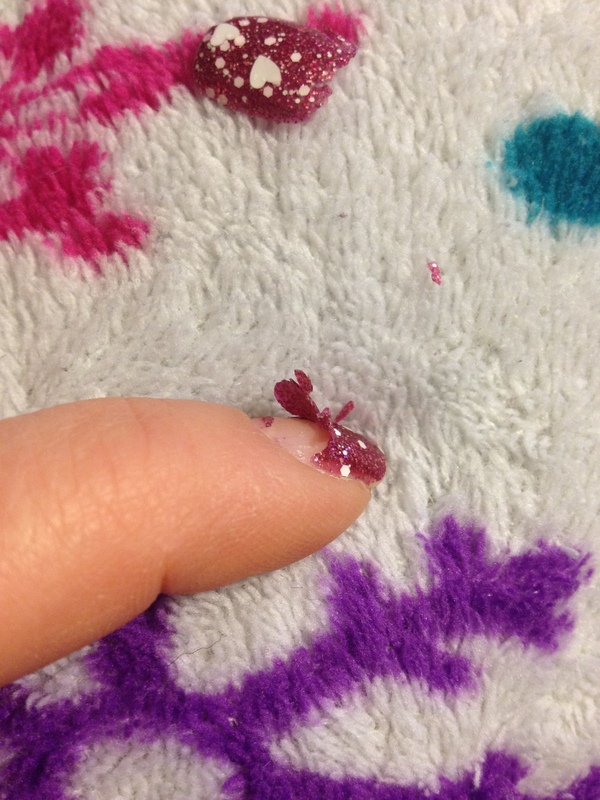 When I tried to use straight-up glue without watering it down, I found that the polish would pop off way too easily with out me even trying to take it off. Plus, it was just thick and hard to apply. A 50/50 glue/water ratio seems to be just perfect. Mix it up well. A toothpick will help you get the job done well. 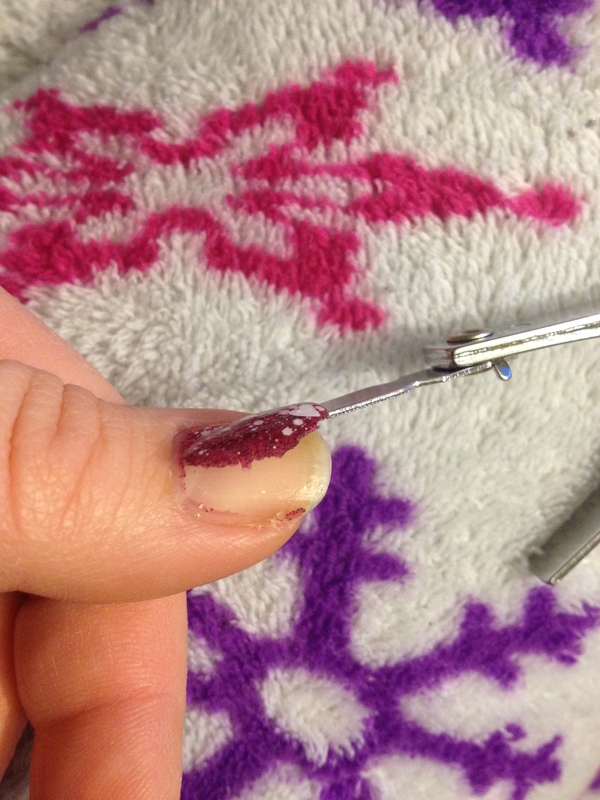 Once you have your watery glue mixed up, apply a thin layer to your bare nails. Another early mistake I made was applying a base coat, then the glue, then the polish. The base coat really did it’s job, and even with the glue layer in there, the polish was REALLY hard to peel off. Wait until the glue is completely dry. It’ll lose it’s shine and become semi-matte. I’m sure I don’t need to tell you this. We’ve all used glue before. Once the glue is completely dry, add your polish. It doesn’t have to be glitter polish. Obviously, you can use this peel-off base with any polish, but the real benefit of the stuff is that it makes glitter polish easy to remove. 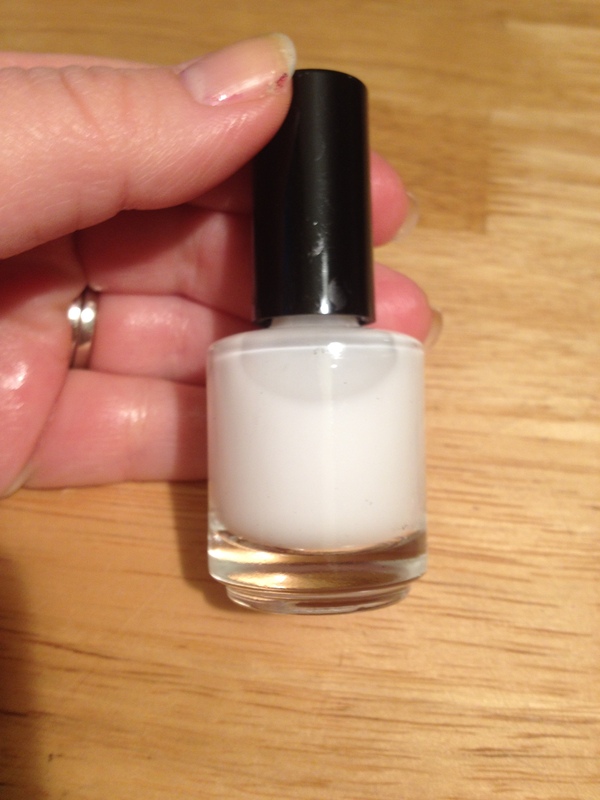 I used Sally Hansen Diamond Strength – Wedding Crasher. It’s just so pretty and sparkly! I felt the mood to fancy it up a bit, so I added Sinful Colors – Love Sprinkles on top. Really, I love this combo! 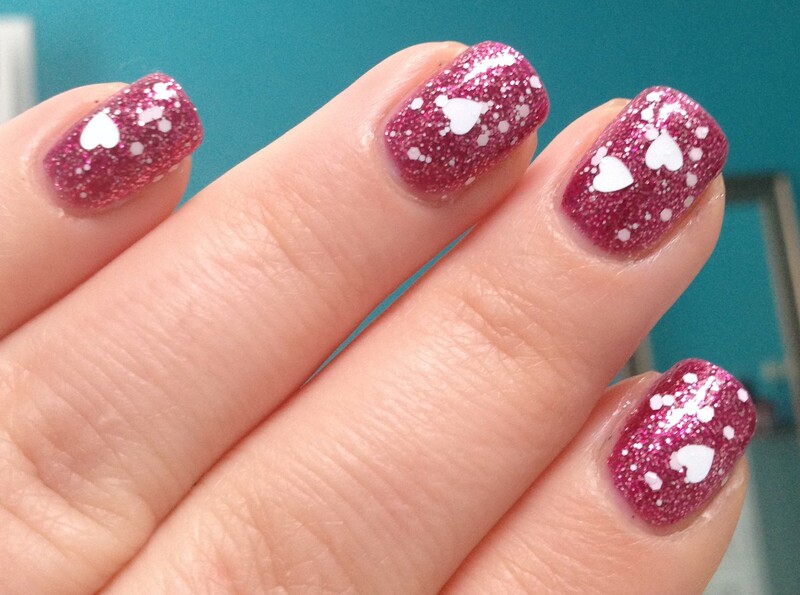 I wish I would have thought about it before Valentine’s Day, but I guess pink polish and hearts are okay anytime. I did my nails on Sunday evening. They lasted for about 48 hours before I got my first major chip. They made it through two showers and lots of hand washing and cooking – not too bad! Since I got a chip, I decided it would be a good time to test the peel-off-ability of the polish. I had to work a little to get each nail s tarted. I found that it was harder to peel the polish off from the cuticle end. It was much easier to start at the tip of the nail where there was already a little tip wear happening. I used a metal cuticle pusher to work the polish off the nail. For most of the nails, the polish came off pretty easily in one or two big pieces. Some nails took a little more effort than others, but overall, I felt the polish came off pretty easily. For me, I felt this was the perfect balance between being easy to remove and not falling off before I wanted it to come off. 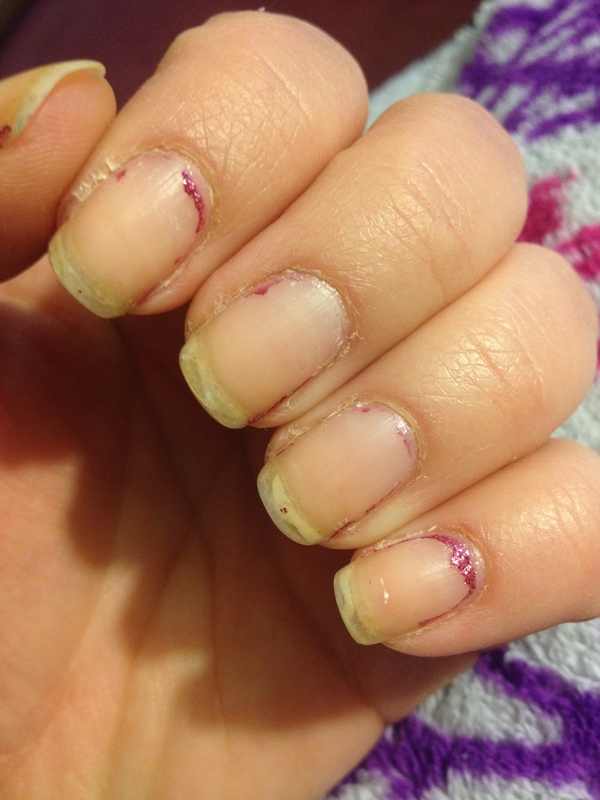 Here are my nails after I peeled the polish off. This is the state of my nails as I type this. (Please ignore the peeling tips, yellow stains, and terribly dry cuticles.) As you can see, there’s still a little bit of polish that I will need to use remove the last little bits of polish, but I can deal with that! Considering that I got a pretty good sized chip in my polish after only two days of wear, I don’t think you could make it for much more than 2 or 3 days using a peel-off base coat. If I had plans to wear a glitter polish for a week, I would probably just use a regular base coat to ensure good wear and just deal with removing it the old fashioned way. I’ve gotta go and put something new on my nails now! Please let me know if you’ve had any experience with a peel-off base or if you are going to give the DIY version a try. Thanks for reading! This entry was posted in Crafting Meets Polishing, Nail Tutorials and tagged peel off base coat, peel off polish. Bookmark the permalink.